Our signature LOOK event has come to its third edition! After the great success of our August and April 2017 events...we are back with the same amazing team! 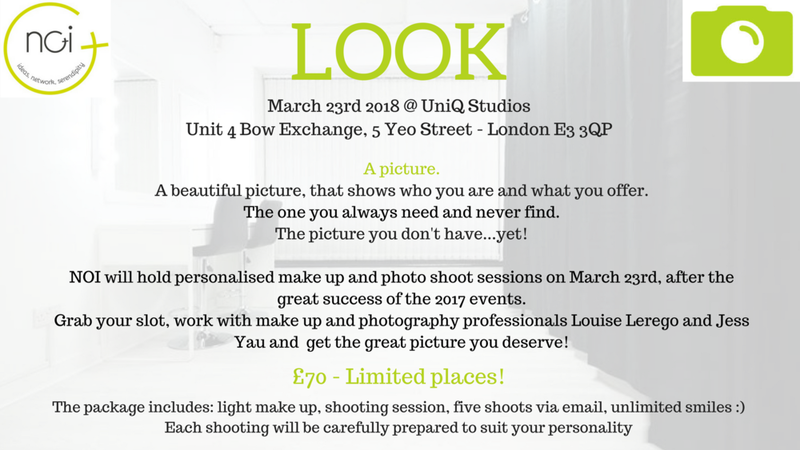 We will work again with superstars make up artist Louise Lerego and photographer Jess Yau and we cannot wait to watch them work their magic! Scroll down to read more about them. Grab your slot fast, we only have a handful of spaces! Jess Yau is a London-based photographer with a fondness for capturing natural portraits and fleeting moments of human interaction. Inspired by those who follow their dreams, she has had the privilege of working with start-ups and entrepreneurs creating product, lifestyle, event and headshot images for their businesses, whilst the romantic in her has a soft spot for engagement and wedding photography. Louise is a London-based freelance makeup artist, specialising in creating fresh, modern makeup. Louise's makeup work spans the fashion, bridal and commercial industries. Her work has taken her backstage at London Fashion Week, working on shoots for corporate clients such as Barclaycard and producing makeup for designer lookbooks.